Atwood Magazine’s writers discuss the music, lyrics, and emotion of the sixth Arctic Monkeys album, Tranquility Base Hotel & Casino, their first record in five years following the success of their most successful album to date, AM. Featured here are Jimmy Crowley, Nicole Almeida, Kaitlyn Zorilla, Matthew Tordoff, Kelly Wynne, Mitch Mosk. Did Tranquility Base Hotel & Casino exceed your expectations, or was it a disappointment? Matthew: The latest album from the Arctic Monkeys is perplexing, to say the least. It’s lunar, and ethereal, and nothing like I was expecting. But, I’m glad the band though outside the box on their latest record, because this new sound is refreshing. Jimmy: It exceeded by leaps and bounds. Granted, my expectations were low going in, because I only like the Arctic Monkeys debut, but I didn’t expect to enjoy it this much. The dystopian and retro tonality really makes me glad I gave the album a chance. It touches on some of the societal unrest from an unsettling point-of-view. The sounds can be fun, but they’re often creeping and don’t leave the listener at ease. I’m thankful that I like multiple Arctic Monkeys albums now. Mitch: It’s been five very long, very complicated years, and I think Tranquility Base Hotel & Casino shows that Arctic Monkeys have been there with us the whole time, experiencing the same chaos and turmoil that’s gotten harder and harder to ignore. Once upon a time in 2006, Arctic Monkeys were the band who evoked our growing pains and pleasures – going out, looking good on the dance floor, relationship complexities, etc. Each Arctic Monkeys record has excelled at depicting the members’ emotional states in the moment; you felt what these humans were going though, getting some semblance of exactly where they were at in their lives. Arctic Monkeys have always been really good at capturing the individual experience, and Tranquility Base Hotel & Casino is no exception: The record feels ominous. It carries this unbearable intensity, like something that’s been shot 1,000 meters up and is about to come plummeting back down to Earth. For me, the two most prominent feelings I’ve sensed in recent years have been pressure and fear – and I think that has as much to do with the emergence of the 24-hour news cycle, as it does with the legitimate threats to world order. But these sensations don’t always translate into our everyday lives – they come and go, rearing their ugly heads now and again. I think Jimmy hit the nail on the head – Tranquility Base Hotel & Casino feels like an attempt to balance normal life against mounting external pressures and fears. It indulges and amplifies our emotions, creating a spaced-out reality that is at once larger than life, as well as a specter (or shadow) of life itself. Honestly, I’m blown away by this record. I didn’t know Arctic Monkeys would be capable of capturing anxiety and instability so well – especially on such a grandiose scale. Nicole: All I knew to expect was a slower, piano-based, ambitious album, and I think Tranquility Base is exactly that. I knew they were going to surprise everyone with their new sound, tackle some more surrealist themes, and essentially make a record that was for them more than for the charts. I massively respect this decision, especially since AM gave them all they essentially needed of commercial success. I love this new album, and every listen I discover a new thing about it that makes me love it more. It’s unapologetically indulgent, and I love albums like that. Kelly: I don’t have a huge opinion on this album. I think five years was too long to wait to release this collection. In that time period, Arctic Monkeys fans have moved on to other things. I think those who have been fans for a long time were expecting something to negate AM and the bandwagon fans that celebrated that album. I think AM fans were wanting something mainstream pop that they could sing along to all summer. I don’t think anyone got exactly what they wanted. Kaitlyn: As a long time Arctic Monkeys fan, I had extremely high expectations for this album. But after reading pre-release reviews, I knew that this album would be a very different one. I was worried that these two things could not easily coexist, but I as soon as I started to listen, I knew I was wrong. This album is masterful in a brand new way and demonstrates the remarkable range of this band. It’s been 5 years since Arctic Monkeys released AM, and they didn’t release any singles leading up to the release of Tranquility Base Hotel & Casino. How did the wait and this strategy affect your anticipation of the new album? Matthew: Honestly, I forgot about Tranquility Base Hotel & Casino altogether, until Spotify recommended it, the day it was released. The five year wait was largely responsible made me forget about the Arctic Monkeys until the newest album dropped. And, I don’t think this was a smart move. After the success of AM this could have been their grandiose return. But, they’ve simply crept back into the limelight, instead. Jimmy: The fact that Arctic Monkeys weren’t releasing singles at the very least sparked my curiosity. The Arctic Monkeys are one of the largest rock bands in the world, and even though I wasn’t a fan, this did command my attention. Even though I haven’t enjoyed any albums post-debut, I still check in, because the band is huge. Whatever the Arctic Monkeys do are a good “State of Rock” address to show what trends have become prominent or will be more famous in the coming year. Kelly: Honestly, I forgot they were releasing an album. As Matthew said, it came up on Spotify and I felt inclined to listen. I loved AM and the things the band has done in the past, but got a little lost when their music made it mainstream. I had no expectations for this album, forgetting that it was even going to happen. Mitch: I didn’t think much of it, to be honest. It was clear that they were keeping things close to the chest and being intentionally vague about the album, and I suppose I enjoyed the excitement of a little mystery. Arctic Monkeys’ first album, Whatever People Say I Am, That’s What I’m Not, is one of my all-time favorite records. I like AM and Favourite Worst Nightmare a lot too, but to me their debut is the raw, real deal. I guess I always look at them as an album-oriented band anyway, so I was just counting down the days until Friday, May 11. I woke up that morning, and the first thing I did was push play on “Star Treatment.” I get it, now – this isn’t a singles record at all. It doesn’t have any obvious chart-topper, and I don’t think it’s supposed to. Like Lord Huron’s new album Vide Noir, I think Tranquility Base Hotel & Casino is best listened to from start to finish, to immerse the listener in another world. Honestly, good for Arctic Monkeys – I’m glad they had the guts to put out an album without pre-release singles. It takes real confidence in your work to do that, and they clearly believe deeply in what this album represents. Kaitlyn: After the massive commercial success of AM, it seemed logical to me that the band would take a big break before releasing more music. Their next move would be under a level of scrutiny that they hadn’t faced before and needed to be well thought out. As a fan, it felt like an extremely long wait, but I think it was well worth it. And we were treated to another album from The Last Shadow Puppets, Alex Turner’s side project with Miles Kane, in 2016 which made the wait more bearable. Nicole: Not very much, since I’m not a diehard Monkeys fan. I was just excited to listen when the buzz started and when people figured out it was going to be very different from previous works. I liked the idea of not releasing singles prior to the album’s release, because I think Tranquility Baseis very much an album that is to be consumed as a whole. How does the prevalence of piano affect the overall mood of the album? Nicole: It definitely makes the album sound classier and more thought out. Like it’s so clear that every sound on the record was included to fit the album’s mood, whereas with their more guitar-heavy previous albums there was a certain coolness to the tracks that made them seem like moments of genius rather than calculated movements. I think the piano really is what allows the album to agree with the narrative concept Alex Turner idealised, and it’s the reason the album flows so well together. Matthew: The presence of such un-apologetic piano influence was jarring, initially. And, because of how prevalent it actually is; the whole album sounds like it could fit, comfortably, in David Bowie’s discography. But, this certainly isn’t a bad thing. The new sound somehow feels like a natural progression from A.M. – and also nothing like it, at the same time. It’s eerie, and eclectic, and a welcome change from the gritty rock sound they made their careers on. Jimmy: The piano was the perfect choice to regain my interest. The most obvious influence is lounge music, but it brought to mind apocalyptic classic rock. It sounds like a cross between David Bowie and Father John Misty, and it’s ominous in every way that I want it to be. Kelly: I saw a hilarious tweet (that I don’t necessarily agree with) that said this album sounds like half of the band forgot to show up to the recording sessions. I think the piano threw people off for sure. The Arctic Monkeys are a British garage-rock band turned pop – the last thing anyone was expecting was a piano base. Personally, I like it because it gives the album a super cohesive sound. From start to finish, the album sounds like it was manicured to fit together. It also feels very ’80s to me, which is so trendy in pop music today. But the band has done it differently. 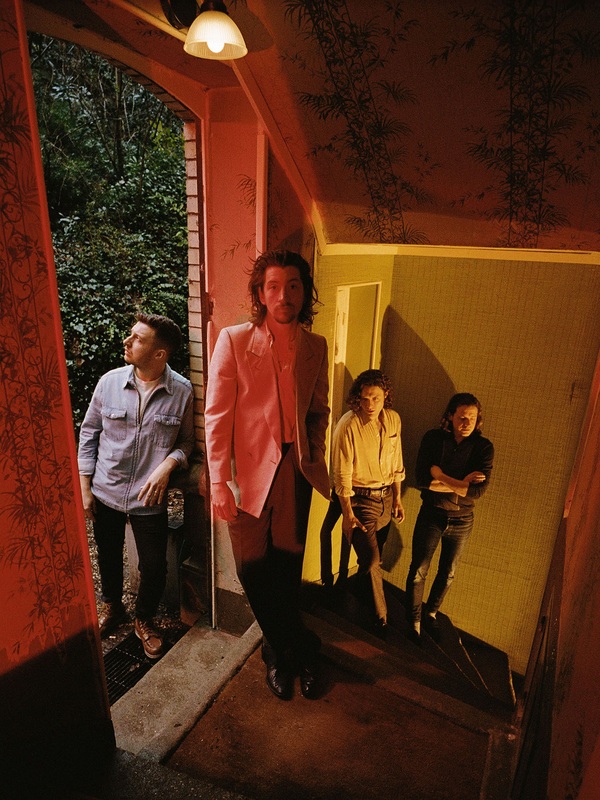 Instead of upbeat ’80s pop (see The 1975), The Arctic Monkeys have ventured into a dark ’80s sound, reminiscent of the original Twin Peaks soundtrack in mood and coloration. Kaitlyn: I think that one of the biggest draws of the Arctic Monkeys’ music–both past and present–is Alex Turner’s ability as a lyricist. With their previously guitar-driven music, it was easy to let Turner’s words take a back seat. The stripped-back arrangements on this album allow for the lyrics to really shine. Turner is also a very talented vocalist and I think he approaches the vocals on this album in a very performative way, reinforcing this image of a band playing in an 80s hotel and casino. Mitch: This isn’t the first time Arctic Monkeys have “branched out” beyond the guitar, so honestly the prevalence of piano or lack of guitar isn’t as big a deal as maybe some others find it. Artists should feel encouraged to learn new instruments and employ new sounds on their records – otherwise we’d have no Sgt. Pepper, no Pet Sounds, and so much more. Jimmy and I must be on the same wavelength, because I personally think that Tranquility Base Hotel & Casino has much of the same emotive and lyrical elements as Father John Misty’s last album, Pure Comedy. As I said earlier, the world beyond our daily lives is really hard to ignore. Nobody’s immune to the chaos, especially globetrotting musicians who see thousands of people come together over a shared love for their music. It must be hard to reconcile that against the “outside” world, where people often tear each other down and focus on their differences. That Arctic Monkeys found a way to tackle immense subjects and branch out so much, while still holding true to themselves, is a testament to them as both musicians and people. So much of this album is “orchestrated” in one way or another, from pianos and synths to violins and cellos, specific use of reverb on vocals or echo on guitar, and more. All of that is indicative of the immense care with which the band approach their music. This album is incredibly wordy. Do you have any stand out lyrics? Matthew: I think cocky, self-referential writing has always been part of the Arctic Monkeys’ appeal. And, the lyrics on Tranquility Base Hotel & Casino lend themselves to spoken word poetry, more than anything else. I’m still not sure what to make of these lines, but damn if there isn’t a ton of emotion to unpack right there. My final highlight is the entrance to “American Sports,” which just seems to reinforce so much of the record’s subject matter and emotional content. I miss Alex Turner’s incredibly personal upheavals on this record. It comes and goes in little sparks here and there; maybe he’s just developed such veiled metaphors that the songs don’t feel quite as personal this time around – I’m sure they are. “The Ultracheese” gives me some of that highly intimate stuff I’ve always loved. What a way to end the record… “I’ve still got pictures of friends on the wall, I might look as if I’m deep in thought… But the truth is I’m probably not, if I ever was.” The best part is, this is a love song. “I’ve done some things that I shouldn’t have done, but I haven’t stopped loving you once.” Bravo. Kelly: I’m definitely a lyrics over melody person, but for some reason I just couldn’t get into the lyrics on this album. It was all about the instrumentals. I browsed through lyrics to try to answer this question, but nothing felt genuine to comment on. I’m sure there are some great lyrics in this collection, but I haven’t gotten that far yet. Nicole: Well, Alex Turner is a genius lyricist. He’s so tongue-in-cheek and makes even the most absurd lines sound poetic (his delivery contributes a lot to the latter). I love it when he says self-references in lines like, “I’m so full of shite” and “I suppose a singer must die.” And some other absurd things like, “Emergency battery pack, just in time for my weekly chat / with God on video call,” the chorus on “Four Out of Five,” and the whole of the self-titled track because it’s just hilarious but so intelligent. Kaitlyn: On “Ultracheese,” Turner takes a step back and says: “I might look like I’m deep in thought / But the truth is I’m probably not / If I ever was.” I love the self-awareness in these lines. For an album that was built on such introspection, I think these lines are a bit of breath of fresh air. What are your least favorite tracks? Jimmy: I didn’t love “She Looks Like Fun.” The vocal effect on Turner really took me out of the song. I think every other part is great, but the bassed out voice singing “She looks like fun” sounds like a weak attempt at John Entwhistle’s “Boris the Spider” growl. Kelly: I’m not a big fan of “American Sports.” It just feels a little like a taste of their old stuff, but a flatter, watered-down version. Kaitlyn: I’m not sure that I actively dislike any of the tracks. I did feel that “One Point Perspective” was a little too similar to “Star Treatment” and their placement as the first two songs on the album made it a little tedious to get into at first. Nicole: I don’t think there are any, to be honest. This album is so solid and cohesive both sonically and thematically that I can’t even stop to consider what it would sound like if one of the songs wasn’t there. Not all of the songs on it make me lose my mind and think this is the greatest thing I’ve ever heard, but I wouldn’t discard any songs on the album. They each fulfill their purpose uniquely and are all brilliant in their own way. Mitch: I’m siding with Nicole on this one. Some of the tracks glide by for me, doing more with tone than with lyrics perhaps, but as with any album, there’s got to be a few moments when you’re allowed to slip into your own daydream, right? What stand out as your favorite tracks? Kelly: “Golden Trunks.” I love the harmonies and how Turner’s voice does really take the lead on the track. This album feels like a dark, velvet-lined casino to me, and this song is a late-night representation of that. Jimmy: “The World’s First Ever Monster Truck Front Flip.” I love the semi-staccato intro that goes into a more droning bleeding chorus. Also Turner’s melody is just creepy enough that it lingers for a long time. “Four Out Of Five” is also great with it’s themes of gentrification and subtly heavy guitar riff. Nicole: I absolutely love “Four Out of Five,” “Star Treatment,” “Tranquility Base Hotel & Casino,” “Golden Trunks,” and “The Ultracheese.” I know I named half of the album here but I really don’t hate any single song on this record, and it’s hard to pick a favourite because they all stand out in different ways but are also so similar. Kaitlyn: “American Sports” was the track that stuck out to me on my first listen through. I really love the piano in this song and I think it taps into the performative nature of Turner’s vocals. I also really like the ballady “Ultracheese.” When I first heard that this album was piano-heavy, this is the kind of song that I was expecting. I love hearing Turner’s unrestrained voice exercising its range.